The Model 16-1-X-X protects equipment from Over, Under, Over/Under voltage or rapid cycling conditions that can damage valuable equipment. Trip and restart delays are adjustable, or can be disabled. Input voltage ranges are 12-30 VAC/VDC or 30-277 VAC/VDC. The 8-pin plug-in has 2 SPDT relays, while the surface mount case has 1 SPDT relay. See Ordering Information for details. 8-pin plug-in versions require an 8-pin socket, such as Time Mark’s Model 51X120. A proprietary microcontroller-based sensing circuit deenergizes the relay(s) after the trip delay (if enabled) upon detection of harmful voltage conditions. The relay(s) will energize after power line conditions return to an acceptable level and the restart delay time has expired (if enabled). Trip delays can be added to avoid nuisance tripping while restart delays can be used to stagger the startup of equipment or protect compressors. 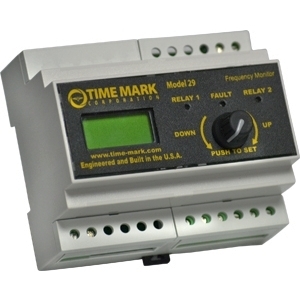 Time Mark’s proprietary microcontroller-based design offers maximum flexibility with an easy to use interface. 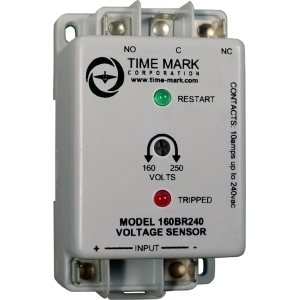 Time Mark products are only sold through authorized Time Mark distributors. The "Buy Online" button will open a new browser window on Octopart.com and display Time Mark distributors that sell your desired product. If Octopart does not currently display the Time Mark product you desire, please call us Toll-Free at (800) 862-2875 or use the Find a Distributor link on our website to find a distributor near you. Model 29 Frequency Monitor has a display that shows the frequency with an accuracy of +/- 0.5%. The display is updated every second and re-initialized every 30 seconds. 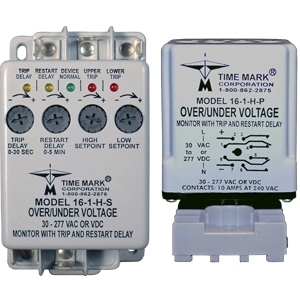 This unit has a user selectable relay option for High-Low or DPDT. It can also be user-selected to energize on fault or de-energize on fault. The user can select automatic or manual restart on the Model 29. The SG version of the Model 29 has silver with gold flash contacts for low current applications Model 29 Frequency Monitor can be restored to factory defaults. 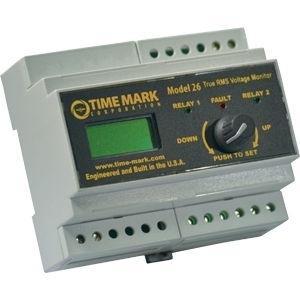 Model 26 True RMS Voltage Monitor has a display that shows the voltage with an accuracy of +/- 0.5%. The display is updated every second and re-initialized every 30 seconds. Model 26 has a rotary encoder with switch on the unit. By pressing the encoder switch for more than 5 seconds, the unit will enter the setup mode. This unit has a user selectable relay option for High-Low or DPDT. It can also be user-selected to energize on fault or de-energize on fault. The user can select automatic or manual restart on the Model 26. Model 26 True RMS Voltage Monitor can be either calibrated using a True RMS Voltmeter or can be restored to factory defaults in the field. The Model 160B(R) Voltage Sensor is a single set-point voltage sensor. Input voltages above the set-point cause the output contacts to energize. Input voltages below the set-point cause the output contacts to de-energize. The dead band between pull-in and drop-out is less than 1%. Wiring connections are made to 1/4 in. ; quick connect terminals. Standard versions have a 2-second restart delay. The R versions of the Model 160B have a fixed 5-minute short cycle delay. The Model 160B has a screwdriver adjustable set-point range of approximately 35% of the maximum voltage. The unit can be factory calibrated to meet specific requirements. AC versions of the Model 160B are not frequency sensitive and may be used in systems from 50 to 400 Hz. DC versions, or other short cycle periods, are available on request.